A TRADE FAIR PURELY DEDICATED TO THE ENTIRE WOOD TRANSPORTATION INDUSTRY! August 16-17, 2019, we welcome you back for the eleventh edition of the expo! Today many view the expo as the most important meeting place within the entire industry! Mittia: Wood Transportation Expo is the trade fair that contributes to a positive develop­ment within all segments of the wood transportation industry. Manufacturers invite hauling companies and timber contractors working within the transportation of logs, bio-energy fuel or processed wood products, as well as companies operating terminals or unloading at sawmills, pulp mills and thermal- or energy power plants. Exhibitors invite forest contractors, railroad and sea operators, contractors building or maintaining forest roads and, of course, companies managing forests, which are often the purchasers of all these services. 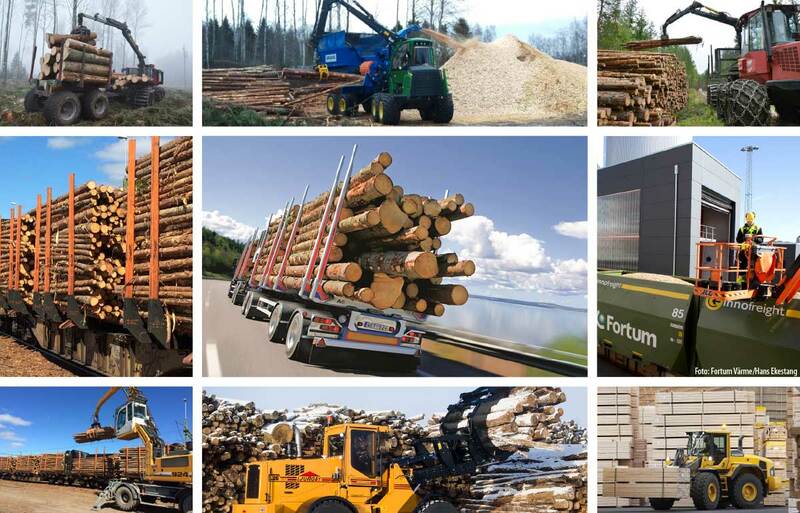 The original since 1999 – the dedicated trade fair collecting all segments of the wood transportation industry – on the road, in the forest and at the plant & terminal. On August 16-17 2019, we open the gates for the eleventh edition of the expo. Producers and vendors of products for every step within the wood transportation chain; vehicles, logging machinery, towed machines, superstructures, truck and terminal cranes, loaders, logging road machines/equipment, equipment for wood transportation by rail and sea, as well as all related peripheral equipment. The expo takes place outdoors in order to establish good conditions for test runs and live ­demonstrations. Haulage contractors, drivers and other staff from the hauling industry. Transportation buyers from forestry companies and the pulp, power and wood industries. Timber contractors and entrepreneurs within terminal management and logging road construction. For 2019, we will further develop the successful concepts from our expo in 2017 with test drives, demo park and an official expo programme with exhibitors’ activities – please consider what you want to arrange already when you book your participation and choose your booth location. THE TOOLS FOR INVITING GENUINE CUSTOMERS! You are the one who knows your existing and potential clients the best – Mittia ­provides the meeting place and the tools for you to invite them. We use a concept based on personal invitations from the exhibitors, giving the recipient free entrance to your booth at the expo. This has proven to be a successful and highly appreciated concept with both expo visitors and exhibitors. With our new eTicket system based on QR code technology as an option, we are adapting the concept to meet modern ­standards while at the same time simplifying your sales administration after the expo. 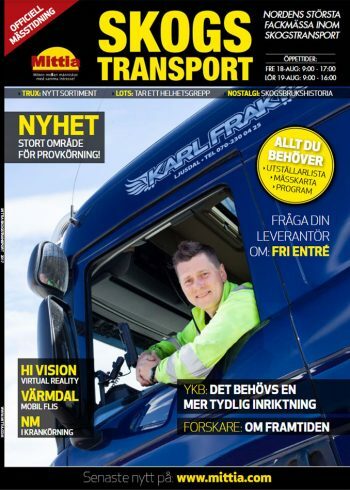 Our own expo magazine in co-operation with Swepress! You can choose to advertise in the expo magazine, which is mailed out to 12 000 quality-ensured recipients, as well as handed out to 3 000 expo visitors. Web! As a registered exhibitor/co-exhibitor you get exposure of your logo and message on the expo’s web site, along with interactive functions for establishing contact through the site. Client zone! As a registered exhibitor/co-exhibitor you will receive a client zone account which works as your planning tool. Here you will find the expo’s graphics as logo and poster, and this is where you place and keep track of your ­orders for expo booth services as well as other services. This is also where you manage your invitations so that you can invite existing and potential clients free of charge to your booth at the expo. Industry press! Mittia markets the expo in leading national industry press. Social media! Use our Facebook page @Mittia: Skogstransport for your news. Welcome to the largest wood transportation trade fair in the Nordics!